In memory of Pat. . .
PAWS animal and event photos are available for viewing and for purchase. Visit our SmugMug site. Click on the logo above. channel. More than 100 PAWS videos are currently available for viewing. Text JOINPAWS to 22828 to sign up for PAWS newsletters and important email alerts. Or, sign up online using the link below! Join our mailing list: Sign up to receive our newsletters and important news alerts below. You may opt out at any time and we will never sell or trade your email address. 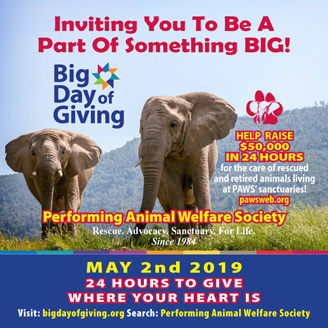 Since 1984, The Performing Animal Welfare Society (PAWS) has been at the forefront of efforts to rescue and provide appropriate, humane sanctuary for animals who have been the victims of the exotic and performing animal trades. PAWS investigates reports of abused performing and exotic animals, documents cruelty and assists in investigations and prosecutions by regulatory agencies to alleviate the suffering of captive wildlife. 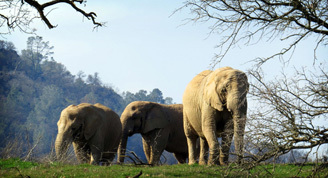 The five elephant habitats at ARK 2000 provide the elephants with hundreds of acres of varied natural terrain to roam, lakes and pools to bathe in, and elephant barns equipped with heated stalls and a indoor therapy pool. Multi-course plant-based lunch will be served. the Circus Cruelty Prevention Act! California State Senator Ben Hueso has introduced SB 313, the Circus Cruelty Prevention Act, to ban the use of wild animals in circuses. PAWS is pleased to be actively supporting this important animal protection bill that would end the abuse and exploitation of these animals for entertainment. In circuses, wild animals are forced to perform under threat of painful punishment, confined in small cages and crates as they are transported from show to show, and generally deprived of all that is natural to them. Both New Jersey and Hawaii have already banned the use of all wild animals in traveling circuses. A hearing has been scheduled for SB 313 in the state Senate Committee on Natural Resources and Water on April 9, 2019. Click here to find out about actions you can take to support the Circus Cruelty Prevention Act. 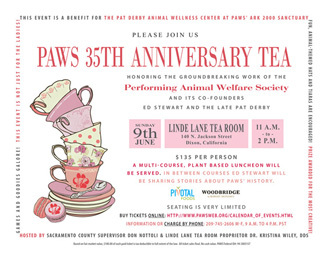 The Performing Animal Welfare Society (PAWS) has reached yet another milestone – 35 years of working to save, care for, and advocate on behalf of captive wild animals – including elephants, bears, and big cats. And we owe it all to you, our supporters, who have been at our side throughout our amazing journey to protect these animals. Founded in 1984 by PAWS President Ed Stewart and the late Pat Derby, PAWS has become a vital and influential organization, recognized worldwide for its expertise in the care of captive wildlife. PAWS has rescued and cared for hundreds of animals throughout the years at our three sanctuaries, from elephants, lions, tigers and bears, to monkeys, exotic antelope and emu. They have come from the entertainment industry, circuses and zoos; some were once someone's exotic pet. 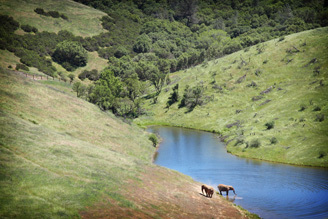 Among PAWS' greatest achievements is the creation of the 2,300-acre ARK 2000 sanctuary in California, which opened in 2002. 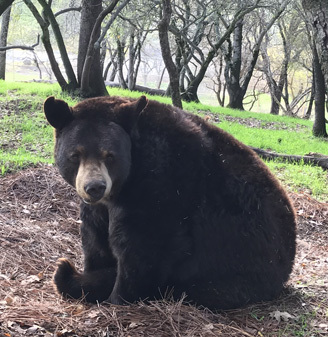 PAWS established a new model for the care of captive wild animals by providing large expanses of space set in nature where big cats, bears and elephants could safely roam grassy, tree-studded hills and engage in behaviors that are important to them. More natural environments, paired with expert husbandry and veterinary care and the monitoring of animals 24 hours a day/seven days a week, make ARK 2000 an important example that others can emulate. While PAWS does not believe in keeping wild animals captive, it is imperative that those animals already in captivity be provided with the best lives possible. While PAWS' primary focus is the rescue and care of captive wild animals, advocacy is another important part of our work. PAWS has always recognized that the only way to end the suffering of captive wild animals is to address the root problems: unrestricted breeding of exotic animals, private ownership of exotic and indigenous wild animals, and the use of wild animals as entertainment. It’s exciting to see realization of the groundwork that PAWS has laid throughout the years, with public sentiment turning against the use of wild animals in entertainment and protective legislation being passed at the local and state levels. Just this year, New Jersey passed the first statewide ban on the use of wild animals in traveling shows, and Illinois and New York passed statewide prohibitions on the use of elephants in circuses in 2017 — bills for which PAWS provided expert support. 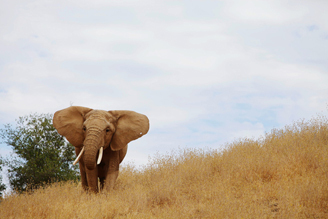 PAWS co-sponsored the successful effort to prohibit cruel elephant bullhooks in California (enacted in 2017) and teamed up to ban bullhooks in Rhode Island. In California, we worked alongside The Humane Society of the United States and the Oakland Zoo to pass this important bill. No California zoo with elephants was using bullhooks at the time, showing how far we've come. But we still have farther to go. There are still zoos using bullhooks in other states. We’ve also seen the world’s largest circus, the Ringling Bros. and Barnum & Bailey Circus, first abandon its trademark elephant acts and then bring down its final curtain, due in part to PAWS’ successful efforts to pass the first bullhook bans in Los Angeles and Oakland, California. These were the first big cities to establish regulations that affected the larger circuses and directly impacted their star attractions. PAWS continues its advocacy efforts on behalf of captive wildlife, with an increased focus on big cats and bears. We also focus on education, including through our biennial International Captive Wildlife Conference, "Wild Animals in Captivity" college outreach program, the PAWS e-newsletter, and ARK 2000's "Seeing the Elephant" and Open House events. As we look back, you might say it’s been a wild ride! We sincerely thank you for your support and invite you to continue working side-by-side with us in this 35th year and beyond. There is so much more to be accomplished for captive wildlife, and so many more animals in need of rescue. Together we can change the world for captive wild animals! 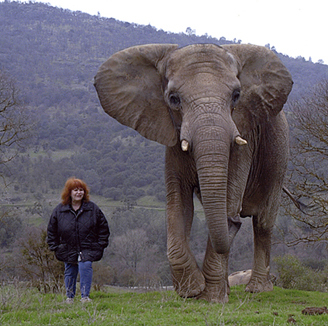 Pat Derby, co-founder of the Performing Animal Welfare Society, was a champion for captive wild and exotic animals, particularly those used in “entertainment.” Working side by side with her partner, current PAWS’ president and co-founder Ed Stewart, they set a new standard of care for captive wildlife, including establishing the first elephant sanctuary in the U.S. Sadly, Pat lost a long battle with cancer and passed away on February 15, 2013. But her spirit continues to live in PAWS’ rescue, sanctuary, and advocacy work. Pat’s bravery and vision for a better life for captive wildlife helped lay the groundwork for the profound changes we are seeing today, including the public’s increasing rejection of the use of wild animals in entertainment, whether elephants and tigers in circuses or orcas in marine parks, and the Ringling Bros. and Barnum & Bailey Circus coming to an end. Her battle against the use of cruel elephhant bullhooks has resulted in statewide bans in California and Rhode Island, with PAWS playing an integral role in their passage. Pat remains an inspiration to everyone at PAWS and to the greater animal protection community. Her determination and fighting spirit continue to drive PAWS’ efforts to create a more just and humane world for captive wild animals, each and every day. 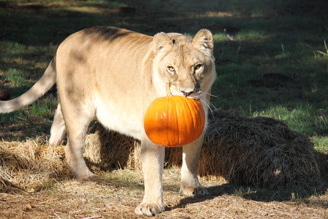 At PAWS Sanctuaries rescued animals live in peaceful, natural habitats, free from fear, chains, and harsh confinement. They are at complete liberty to act out natural behaviors in the comfort of their individually designed enclosures. 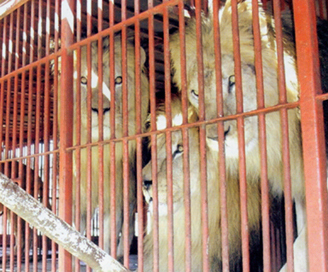 PAWS' animals are not bred, traded, sold, rented or forced to perform in any way. PAWS educates the entertainment industry, public officials and the general public in humane care and treatment of captive wildlife. 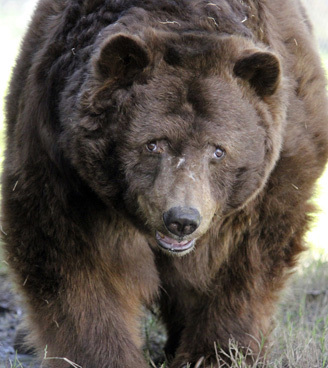 March 20, 2019 — It is with deep sadness that we report the death of beloved black bear Arthur who arrived at PAWS 17 years ago this month. His estimated age at that time was about 10 years. He leaves a giant, bear-sized hole in our hearts and he will be greatly missed by all who knew him and who had the honor of caring for him. 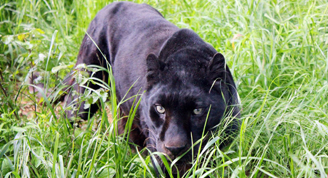 PAWS is part of a coalition of animal protection groups applauding the introduction of the Big Cat Public Safety Act, H.R. 1380, in the U.S. House of Representatives. Championed by Representatives Michael Quigley of Illinois, Brian Fitzpatrick of Pennsylvania and 52 bipartisan co-sponsors, the bill would keep dangerous big cats like tigers, lions, leopards and cougars out of private hands and prohibit the use of big cat cubs for the public to pet, feed, take photos and play with. Cub petting attractions cause immeasurable suffering and threaten human safety. “Surplus” big cats produced by these operations can fuel the illegal market for animal parts and seriously undermine efforts to conserve these iconic animals. Currently, there is a patchwork of state laws regulating private ownership of big cats – and some states have no laws at all. A federal law is necessary to end the unregulated trade and nationwide abuse of big cats. Read the press release here. Contact your U.S. representative today and ask that s/he support the Big Cat Public Safety Act. I recently heard about a comment made by a zoo employee, who said that PAWS’ ARK 2000 sanctuary is “just a bigger zoo.” My immediate response was: How superficial! That person really doesn’t understand what a sanctuary is all about. Obviously, space is important, especially when you’re caring for the planet’s largest land mammal. Elephants need room to move and stay healthy. But there are many factors that distinguish PAWS from other captive institutions. We are here to serve the wild animals in our care; their welfare is our primary concern. PAWS holds the highest standards of care for the animals, provided by a dedicated caregiver staff and veterinary team. The animals are cared for 24 hours a day, 7 days a week, and treated with the respect they deserve. At ARK 2000 we use confinement to protect and better serve the animals, rather than control and display them for human amusement. PAWS openly acknowledges that even the greatly improved conditions we provide are still not enough to meet the needs of wild animals. As PAWS President Ed Stewart has said, "The only “state of the art” place for elephants, bears, big cats and other animals is the wild." A true captive wildlife sanctuary does not breed, buy, trade, sell or otherwise exploit animals. The animals who come to ARK 2000 will remain in our care for the rest of their lives. Important social bonds are respected and will remain undisturbed. Our animals do not perform, and the public is never in direct contact with them – no selfies, feeding, or other so-called “educational” encounters. PAWS' focus is on the individual for the sake of that animal only. They are not ambassadors for their species nor are they on display to send a message. If there is any message, it is that the situations these animals were rescued from, and the abuse and deprivations some of them suffered, should not be allowed to exist. Larger spaces allow for more environmental complexity and more choice for the animals, whether it is engaging in self-directed activities or choosing to be closer to or farther from companions. At ARK 2000 the animals are immersed in complex natural areas that change with the seasons, effecting different behavioral opportunities and sensory experiences. A large, natural habitat sanctuary offers subtle benefits: the quiet of living in nature, more intrusion-free lives, the relaxation that comes from no longer being exposed to the pressures of close confinement and social stress, privacy, and expanded visual, auditory and olfactory experiences. 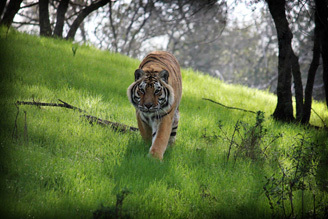 PAWS strives to help elephants be elephants, tigers be tigers, and bears be bears. Natural environments filled with grass, shady trees, bushes and lakes allow the animals to actively engage in instinctive behaviors such as foraging, swimming, exploring, climbing, socializing, or simply napping in the sun. Our patient and caring staff is there to support the animals and enable their remarkable transformation to the vibrant and thriving animals they are today. 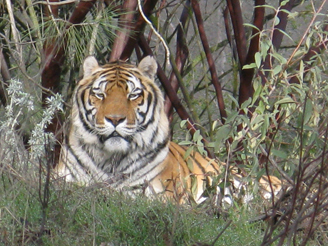 PAWS seeks to create a deeper understanding of the problematic nature of captivity for wild animals and works to end the systems of abuse and exploitation that have created the need for sanctuaries to begin with. Captivity is not normal and we should not idealize it, even with the best of conditions. Wild animals belong in the wild, protected and respected. As you can see, PAWS is much, much more than just a “bigger zoo.” It is a place that offers a new lease on life for the elephants, big cats, bears and other wild animals currently in our care – and those yet to come. It is also a place where each animal is respected as an individual with her or his own inherent value, and whose welfare and needs will always come first. Catherine Zugar: One 5 lb. tub of Psyllium; one gal. of Red Cell; one bottle of AminaVast, 60#. Danielle T. Olander: one 10 lb. tub of Psyllium; two 5 lb. tubs of Psyllium; two 8 oz. bottles of EicosaDerm; one gal. of Red Cell, one qt. of Red Cell. Jessica Martin: two 8 oz. bottles of EicosaDerm. Judy Fukunaga: one 32 oz. bottle of EicosaDerm; one bottle of Azodyl, 90#; one Probiocin; one 8 oz. bottle of EicosaDerm; one 20 lb. tub of Psyllium. Nancy Gordon: "Veterinary Parasitology Reference Manual" for the veterinary library at the Pat Derby Animal Wellness Center at ARK 2000. Carole Bognar: one bottle of Renal Essentials, 60#; one 8 oz. bottle of EicosaDerm. Mary Goode: one bag of Greenies Pill Pockets, 60#; one Probiocin; one bottle of Renal Essentials, 60#. Danielle Anderson: one qt. Red Cell. Anonymous Donors: four 5 lb. bags of Missing Link; three bottles of Clorox bleach; "Veterinary Hematology: Atlas of Common Domestic and Non-Domestic Species" for the veterinary library at the Pat Derby Animal Wellness Center at ARK 2000. View wish list items that are needed, but not included on our Amazon list here. Copyright Performing Animal Welfare Society. All Rights Reserved. Copyright for photos belongs solely to PAWS.